I have shared many times how much I absolutely love the Teaching Tolerance website. They have soooo many great activities and lessons, many of which I have used in my work as a school counselor. 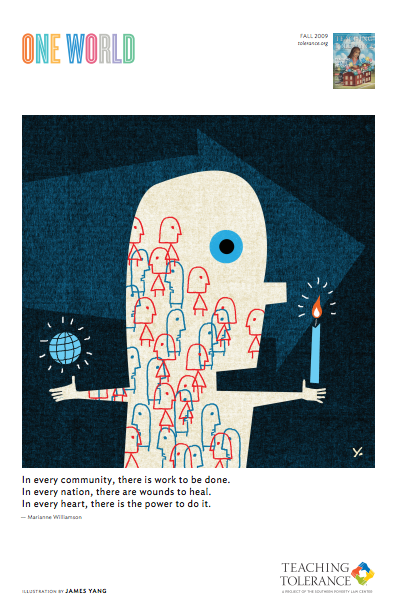 One of my favorite parts of theTeaching Tolerance Magazine (that educators can receive for FREE) is the "One World" poster at the back. The "One World" posters are always so beautiful and have such a great message. I was so excited to learn yesterday that Teaching Tolerance has select "One World" posters available for you to download on their website for FREE! The image quality is great so you can get them printed to up to 11" x 17" size to hang in your school counseling office or somewhere in your school! You can also do a search and find other smaller "One World" posters available to download for FREE! This "One World" poster below reminded me of the work we do as school counselors. Which Teaching Tolerance "One World" poster is your favorite? Where will you hang your FREE "One World" Posters?